Canton announces DM 50 "sound plinth" TV speaker | What Hi-Fi? The Canton DM 50 joins the growing trend of home cinema soundbars that sit underneath your TV. It's on sale at the beginning of October for £399. Canton has announced the release of the Canton DM 50, a 'sound plinth' that fits underneath your TV to produce a stereo surround sound experience. 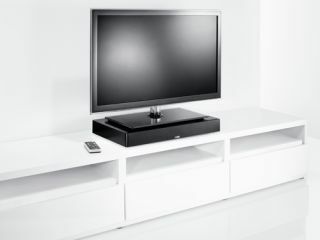 Taller than the LG Sound Plate and around the same height as the Denon DHT-T100 TV speaker base, the DM 50 soundbar stands at 7 centimeters high. It supports flat screen TV sizes of up to 40in and can be set on a shelf or sideboard easily enough. Connections amount to two digital inputs (optical and coaxial, no HDMI) alongside a sole analogue input allowing the user the freedom to connect several devices to the DM 50 at once. The home audio experience can be adjusted through one of three presets, with Dolby Digital and DTS TruSurround formats also supported out of the box. The Canton DM 50 also supports wireless streaming, with access to the music on your computer, smartphone or tablet coming by way of aptx Bluetooth. The 2.1 speaker also comes with an integrated subwoofer, with a sub out cable also available to hook up an additional external subwoofer should you simply want to gorge on bass. The Canton DM 50 is available in three finishes: black, silver and eggshell white, and will be available to buy from the beginning of October for £399.